# Put the milk, tahini halva and granulated sugar into a non-aluminium pot, cook it over medium heat by stirring constantly. 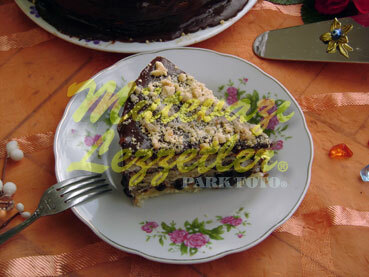 # Add margarine and cocoa into the mixture, stir it by mashing while cooking to smoothen it. # Place the wafer onto a flat plate, lay 1/3 of the hot mixture onto the wafer on the plate. # Place the second wafer onto the mixture, lay 1/3 of the hot mixture all over. # After placing the last wafer onto the hot mixture, cover the wafers with the remaining mixture. # Cool the dessert at the room temperature, sprinkle pounded hazelnut and coconut all over. # Slice and serve it. Note: The tahini which is ingredient of the halva is made of sesame. 26.5 ounces of tahini is made of 2.20 pounds sesame.